Many woodworking projects call for dadoes or rabbets. Years ago, these would have most likely been cut using a specialty plane or by hand with a chisel. These days, with all of the manufactured wood products and power tools, these methods would be considered nostalgic. A more modern method for cutting these joints would be with a dado blade on your table saw or radial-arm saw. The stacked dado set is typically considered the better option, for a number of reasons. 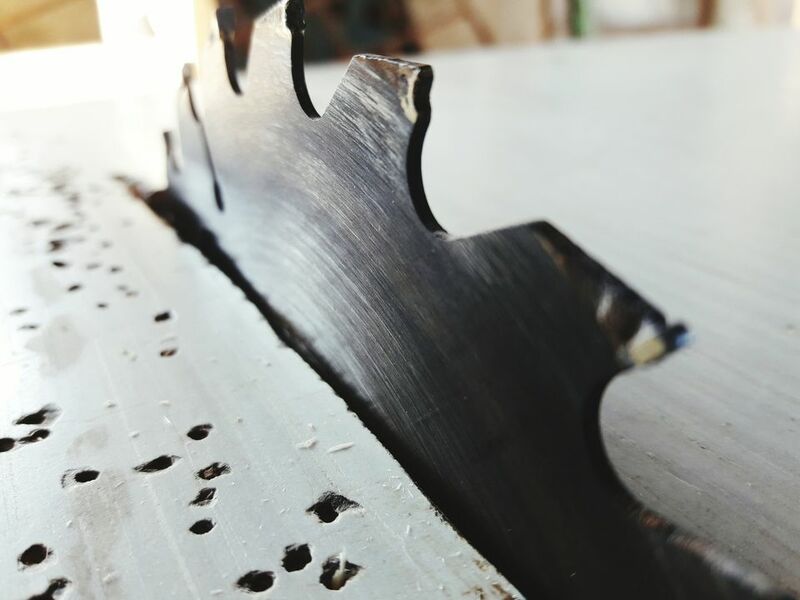 First of all, a stacked dado set consists of two saw blades and a number of "chippers" that fit between the two blades on the saw's arbor. The width of the dado is determined by the number of chippers installed between the inner and outer saw blade. By contrast, a wobble dado blade is a single blade that has a collar that allows the blade to be set up at various angles. The blade then "wobbles" as it cuts. The steeper the angle, the wider the cut. The instructions that accompany your stacked dado will go into detail as to the configurations necessary to create cuts of various widths. However, most sets contain four 1/8" wide kerf chippers and a single 1/16" chipper. The inner and outer blades each have a 1/8" kerf as well. Since the set cannot be used without the inner and outer blades, the minimum cut width would be 1/4". 5/16" cut - Add only the 1/16" chipper between the blades. 3/8" cut - Add only one 1/8" chipper. 7/16" cut - Add one 1/8" and one 1/16" chipper. 1/2" cut - Add two 1/8" chippers. 9/16" cut - Add two 1/8" and one 1/16" chipper. 5/8" cut - Add three 1/8" chippers. 11/16" cut - Add three 1/8" and one 1/16" chipper. 3/4" cut - Add four 1/8" chippers. 13/16" cut - Add four 1/8" and one 1/16" chipper. When positioning your stacked dado set onto your saw's arbor, always make sure that the arbor is long enough to accommodate the blades you're adding. In other words, there needs to be enough arbor length that the arbor nut is fully threaded onto the arbor when tightened against the blade. Also, when using a stacked dado blade on a table saw, be certain that you use a dado throat plate (or make one specifically for the task out of plywood). Never attempt to use a dado blade with the throat plate removed. Finally, never attempt to use a stacked dado (or wobble dado, for that matter) with a circular saw. This simply isn't safe, as these are designed for use with a radial arm or table saw only. In addition to the two blades and the chippers, your set will likely also include some spacers that look like thin washers. These spacers can be used in between the blades and chippers to add a little additional width. This is especially handy when cutting dadoes or rabbets for plywood, which typically has widths such as 15/32" or 23/32".